His face was unveiled today in Lima, Peru – and MailOnline had exclusive access to see the results. Lord of Sipán ruled the Moche civilisation, which flourished in Peru between AD 50 and AD 700. The name comes from an site in a valley of the same name which was the central city for the Moche people. The Moche people are known for their elaborate pottery and jewellery as well as for pioneering early metal working skills. What’s more, they build numerous large pyramids, some of which still dominate the landscape. Evidence suggests that the Moche people engaged in a form of ritual combat, followed by human sacrifice. Until the discovery of the Lord of Sipán’s tomb in 1979, the best known remains of the civilisation were two large structures – the Temple of the Sun (Huaca del Sol) and the Temple of the Moon (Huaca de la Luna) – near Trujillo. The reasons for the collapse of the Moche culture are unknown, but experts have suggested prolonged drought, earthquakes, or extreme flooding from the El Niño phenomenon may have been to blame. Some experts suggest a civil war may have been the cause of their downfall. Cicero Moraes, the 3D computer graphics designer responsible for reconstructing the virtual features of the ancient leader, worked alongside forensic dentist, Dr Paulo Miamoto, who conducted anthropological analysis on the ancestry of the king. The researchers, both members of the Brazilian Team of Forensic Anthropology and Forensic Odontology, revealed that the king was aged between 45 to 55. ‘He has the typical features of pre-Columbian ancestry and looks like the original South American indigenous Indians that lived here hundreds of years ago,’ said Dr Miamoto. The project, sponsored by the Inca Garcilaso de la Vega University (UIGV) in Lima, Peru, has been an exciting challenge but was far from straightforward, according to the Brazilian scientists. 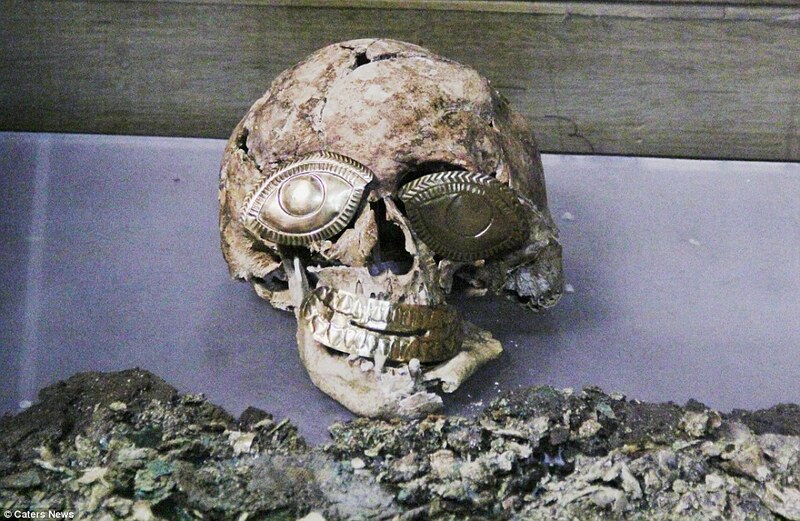 ‘The Lord of Sipán’s skull was severely damaged,’ Mr Moraes revealed.